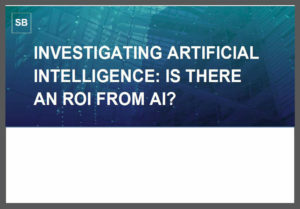 Is There an ROI from AI? Artificial intelligence (AI) has rapidly climbed the list of technologies that are most captivating and enticing to modern, data-driven companies. With any technology, though, the question always arises: Can I turn this into business performance? Aberdeen’s research demonstrates a variety of ways that top performers are able to leverage AI to deliver results.